I’ve grown up with this sports and think it is fantastic for it is team focused and brings together people from completely different background. I used to play actively in a club (1.FC Wilmersdorf, Tennis Borussia, SC Charlottenburg) when I was younger but these days do not have the time, so it is more common that I play outside in summer and in freezing times in the gym. I am watching football too, my favorite team is of course the local club Hertha BSC Berlin where I am going to the stadium since I can think. 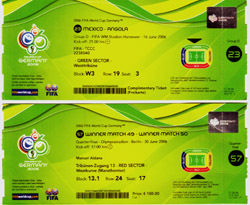 The definite higlight was the world cup tournament in Germany in 2006, and lucky me I could visit two games (Angola-Mexico, Germany-Argentina). This was so overwhelming, I’ve never experienced such vibes at a sports event. Another nice thing noticable was that football really connected people from allover the world.